Footage has emerged of the astonishing moment a man in a red suit punched a Newark bishop right in the face during mass before being tackled to the floor. 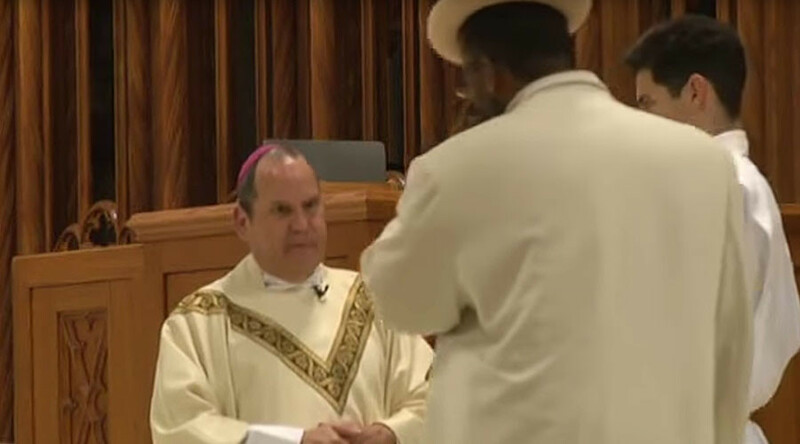 Auxiliary Bishop of the Newark Archdiocese, Manuel A Cruz was attacked by a churchgoer on Saturday as he was absolving the congregation of sins. Video of the Cathedral Basilica of the Sacred Heart mass shows one attendee casually approach the altar before punching the man of God. Three security guards were forced to apprehend the attacker, while an altar boy and members of the congregation checked on the fallen bishop. According to Tap into Newark, the afternoon mass was in memory of baseball great Roberto Clemente. The bishop received facial injuries and his crucifix and clothes were “full of blood,” an eyewitness told ABC 7. Charles E Miller, 48, appeared in a Newark court on Monday charged with the incident, NJ.com reports. Miller remains in Essex County Correctional Facility pending the hearing of his case. The facility’s database reveals Miller is facing a charges concerned with “aggravated assault” and “serious bodily injury”. Bishop Cruz was taken to hospital but is now reported to be recovering and “doing well”. “Thank you for your thoughts and prayers for Bishop Cruz. He is doing well, and is back at the cathedral residence,” a Newark Archdiocese statement read. In 1980 Bishop Cruz became the first Cuban-born priest to be ordained in the area, according to the Catholic parish website.